Simon grew up in Suffolk and was head chorister, at St Edmundsbury Cathedral. Much later he enjoyed a choral scholarship at St John’s College, Cambridge, whilst studying for his degree in Theology. During this period he cut his teeth as a soloist around and about the various colleges, and in oratorio engagements at cathedrals and churches throughout the country. Upon graduating, he worked as personal assistant to composer John Rutter for three years, after which he took up a scholarship at the Royal Academy of Music in London, to study with Ashley Stafford. Simon has given recitals singing a wide repertoire including English and French song, Lieder and operatic arias together with substantial dramatic works such as Britten’s Abraham and Isaac and The Journey of the Magi. During 2003 he premiered solos in John Tavener’s brand new epic (7 hour duration) The Veil of the Temple, which called for him to sing a 15 minute unaccompanied gospel at 5am! He did so again at the Lincoln Center, New York (the US premiere) and at the BBC Proms, his solo debut there. This version has since been released as a CD on RCA. In 2007 he gave a Cantata concert at Temple Church with the Temple Players. 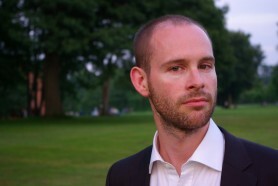 He has appeared as a soloist with The Monteverdi Choir conducted by Sir John Eliot Gardiner in the USA in Haydn masses, and in Europe and the Far East in Purcell’s Dido and Aeneas; for Polyphony, in Hyperion recordings of James Macmillan’s Seven Last Words, conducted by Stephen Layton; at the Three Choirs Festival under Hickox, and for Laurence Cummings at the Spitalfields Festival singing as principal tenor soloist in the Monteverdi Vespers; Messiah for the Edinburgh Royal Choral Union at the Usher Hall in Edinburgh and for Sir David Willcocks in Bern – amongst many others! Simon has dipped his toe into the operatic pool, creating the role Owl, as part of the vocal group I Fagiolini, in a brand new work, The Birds by Ed Hughes, which premiered at the City of London Festival in July 2005. More recently, Simon played Eco in Monteverdi’s Orfeo, conducted by Emmanuelle Haim in Théâtre du Châtelet, Opéra de Lille, and Opéra du Rhin. He has recorded Barber’s operetta A Hand of Bridge – conducted by Marin Alsop, with the Royal Scottish National Orchestra (Naxos). In 2008 he appeared as the Sailor in Purcell’s Dido and Aeneas as part of the Temple Festival in London and with the Orchestra of the Age of Enlightenment at the Queen Elizabeth Hall. He returned to France in 2008/9 for Purcell’s Fairy Queen at the Opera de Lille again with Emmanuelle Haim. Recent recordings include Caccini songs with La Nuova Musica, Charles Wood’s epic St Mark Passion (Evangelist) with the choir of Jesus College, Cambridge and the Monteverdi Vespers with The Rodolfus Choir as well as Lamenti, a disc of Monteverdi with Le Concert d’Astrée/Emmanuelle Haim. Recent engagements include the role of Damon Acis and Galatea at the London Handel Festival Evangelist in Bach’s St Matthew Passion at the Aldeburgh Festival, conducted by Masaaki Suzuki, the title role in Handel’s Jepthe at the 15th Haapsalu Early Music Festival, Estonia and John McCabe’s Songs of the Garden at the Three Choirs Festival and on BBC Radio 3. He sang John Blow’s Ode on the Death of Mr Henry Purcell at a BBC Chamber Music Prom, also live on BBC Radio 3 and last December he toured Israel with the Choir of Clare College, Cambridge and the Israel Camerata with Bach’s Weihnachtsoratorium. This year he has sung Evangelist (St Matthew Passion) with King’s College Choir in Cambridge, toured the UK and Europe with the Orchestra of the Age of Enlightenment in Monteverdi’s Vespers of 1610 and returned to Israel for Purcell’s King Arthur conducted by Andrew Parrott. Simon is taught by David Maxwell Anderson. “The virtuosic Rejoice Greatly was handed over to the focused expertise of tenor lay vicar Simon Wall..."